2005. 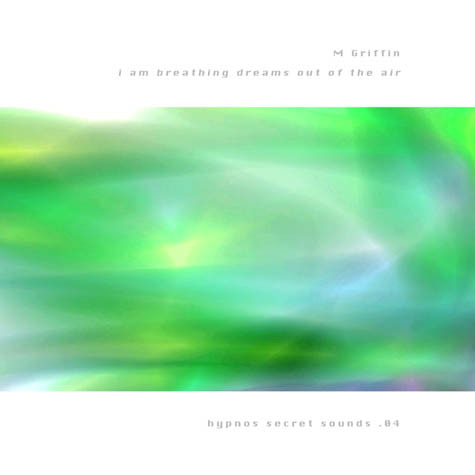 Now available, the newest release of minimal/drone ambient from M Griffin, I am breathing dreams out of the air. In a very real sense, this is a "sequel" to this year's previous M Griffin release on Hypnos Secret Sounds, Sounds are Hidden Inside Objects. The style is pure, atmospheric minimal drone, very deep and evocative and mysterious, complex enough that it is neither truly dark nor light. 1. "I breathe as the water flows over me"
2. "I dream the same girl in every dream"
3. "I must go to the place I have never seen"
4. "I visit a future without identity and forget myself"
5. "I condense the universe into a thought and memorize it"